Ohio SR22 Insurance: Getting cheap coverage (Updated 2016) – Select Insurance Group provides cheap Ohio SR22 insurance at low cost. We shop multiple companies to provide competitive SR22 solutions to our customers. It is always good to shop around insurance companies and compare SR22 rates. We guarantee hassle-free and affordable experience with us. What is Ohio SR22 insurance? Why would BMV require SR22 filing in Ohio? Who needs SR22 insurance in Ohio? What is Ohio SR22 Bond? What is the difference between SR22 bond and SR22 insurance in Ohio? How to get cheap SR22 insurance in Ohio? What Select Insurance Group can do for you? 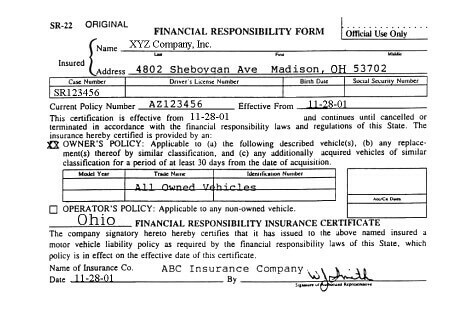 Ohio SR22 insurance is a document issued by insurance provider that proves your financial responsibility. “SR” corresponds to Safety Responsibility. According to this certificate a driver is able to maintain regular car insurance coverage. It is illegal to drive without car insurance in Ohio. $12,500 “BI” – Total amount to be paid for bodily injury. Per person. $25,000 Total amount to be paid per accident for all “BI” individuals. The ones who file first – will get the coverage up to states limits. If limits already reached it is necessary to contact policy holder for any sums over original amount. Filing SR22 insurance is state mandated and court-ordered as a proof of driver’s financial responsibility. Whenever you are ordered by a court to have SR22 – you’ll be just informed about SR22 requirement at the time of court processing. Also Ohio SR22 insurance requirement is mandated by Bureau of Motor Vehicles in order to reinstate driver’s license. Eventually BMV will send you the notice informing you about the need of SR22 certificate. Hope you will never get such notice :).You are more than welcome to share your experience with BMV to help other drivers! SR22 may be required by BMV in Ohio as a result of multiple traffic offenses. If you caught on driving under the influence of alcohol you may be required to carry SR22. Also it can happen for driving without insurance or multiple traffic violations that occurred over time. For example by reaching 12 points on your driving record in less then 2 year period. Operator’s certificate – this is required when you need an insurance policy to a vehicle that you don’t own. Owner’s certificate – issued to a driver who aims to cover all driven vehicles that he own. All the details about owned vehicles are stated in Ohio SR22 form. Operator-Owner Certificate – this option will take care of all vehicles that are owned and not owned (but operated) by driver. SR22 form is issued by certified insurance provider in Ohio like Select Insurance Group. We have license in every state that has SR22 laws. Don’t hesitate and get your Ohio SR22 quotes now! But let’s get back to the point. As you may have noticed, SR22 does not stand as like regular car insurance. That means not every car insurance provider can issue an SR22 for you. SR22 is official prove to State Bureau of Motor Vehicles that you can get and maintain your regular car insurance. Here at Select Insurance Group we make sure that your filing is properly set and maintained during the period of requirement. Common reason for SR22 is to reinstate driver’s license and get back on a road. In some areas of United States it is almost impossible to have normal life without a car. DWI – driving while intoxicated. For example: Marijuana or other drugs. The driver caught on driving without insurance. You need to find good insurance company that has license to provide such services. You can cross it from your list, because Select Insurance Group is here for all your filing needs. We will fill out your Ohio SR22 insurance policy on your behalf based on your personal information. We will instantly inform State Bureau of Motor Vehicles about your SR22 filing. Your policy is e-filed and can be issued within 5 minutes of your time. You will be able to download and print your policy from your home or office. One of our licensed agents will be calling you to confirm some details on your policy. After payment your policy becomes active. It is always good to understand that SR22 requirement in Ohio is for drivers who are in high-risk category. High-risk category assumes higher insurance premiums and more spending. Typically SR22 insurance is required for 3 years. If you caught on driving without insurance or got into an accident without liability coverage you will most likely be required to carry SR22 for 3 years. However if you caught on driving under the influence of alcohol it is very possible to get SR22 for 5 years. It is mandatory to maintain valid SR22 status for a whole period of requirement. If a driver fails to maintain his policy insurance provider will issue SR26 form of cancellation. The BMV will be immediately informed about your policy cancellation and your driver’s license will be suspended. You will need to start over with Ohio SR22 to reinstate driver’s license. Make sure to carry it non-stop for a full period of requirement. Ohio SR22 bond refers to liability protection of $25,000 per accident and $12,500 per person plus $7,500 for property damage. No matter which car you are driving – this bond will cover your liability needs. Please always remember that this bond will not insure your vehicle. SR22 bond in Ohio is only for liability protection. 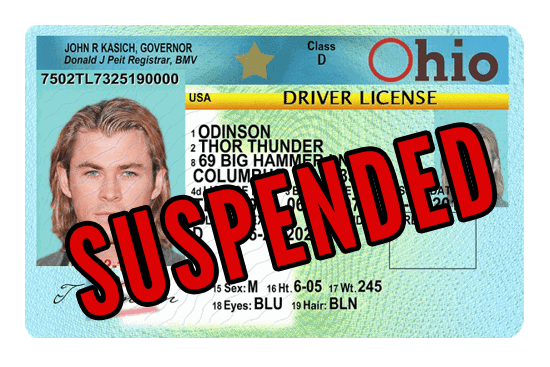 Ohio SR22 bond filing is required by the BMV in order to reinstate your driver’s license. Your filing will prove that you have minimum insurance coverage that is required by law in Ohio. In case you don’t want to protect your car and yourself of uninsured drivers – bond is a right choice for you. It will just take care of court ordered minimum liability requirements. SR22 insurance will add such benefits as comprehensive and collision coverage for your car. It will also fulfill liability requirements. Most of the people chose SR22 insurance instead of SR22 bonds. Your driving history – many states don’t use SR22 requirements for the first time offences. It is commonly used for repeatable convictions. With that being said, you final SR22 insurance cost will be determined by number of traffic violations that you had before such as DUis, accident claims, etc. Your age – it is well known, that insurance premiums will cost more for young people that are under 25 years old. However, people that are 55+ paying less. Based on our stats SR22 insurance is mostly required by both males and females at the age of 23-35. Life style – if your daily routine requires lots of driving that may be a result of higher rates. It is simple – if you don’t drive much then you have lower risks get into an accident. Location – those areas with higher crime rate or higher population density will have influence on costs. If you live in such cities like Columbus, Cleveland or Cincinnati – your SR22 rates might be relatively higher than in smaller areas. Marital status – person who is already married is considered to be more stable and responsible. If you are married you’ll get lower rates than a person in same situation but is not married. Gender – usually men are having more troubles with the law then women. That is why males pay slightly more than females. Class of your car – driving some fast car will get you higher premiums. Based on stats risk drivers use high performance cars. Also such cars are more costly to repair then regular ones. Credit Score – if you have bad history with banks that may cause higher insurance rates. Instead of buying another six-pack of beer it is better sometime to look up for your bills. Good credit score may save you a lot of unwanted payments. That is applicable not only for SR22 in Ohio. By analyzing the market we came to conclusion that maximum cost for SR22 insurance can reach up to $25/a month. Due to the fact that Select Insurance Group has its own developed network – we can offer competitive prices. We shop multiple vendors to get you affordable SR22 in Ohio. Select Insurance Group can offer as low as $15/month as a cost of SR22 insurance in Ohio. We are also having discount program that can even lower your rates. To find more – just fill out our quote form. It will take a few minutes of your time. Filing is simple. Just fill our form for instant quotes. Shop around – cost for SR22 insurance can be higher with your original car insurance provider. It is always good to shop around and determine best option for you. Try us. Here in Select Insurance Group we offer affordable solutions to even hard to insure drivers. Pay greater deductible – of course, you’ll be paying more out of pocket. However if you aim safe driving it may save you some cash on car insurance. Just try to determine the limit that you will be comfortable to pay. Consider buying an older vehicle. Let’s say 10+ years old should be good. Also make sure it’s slower too, because in other way it will not make sense, right? This car should not be under loan. Otherwise full coverage is required. Take some courses on great driving. Such driver who finished safe driving programs can always ask his insurance provider to run another vehicle repot to see if any options available. The next policy renewals can possibly get lower amounts to pay. Check your policy if it’s possible to remove collision coverage if you have older vehicle. In case you have relatively new vehicle check for available discounts. Possible discounts may be available for air bags, ABS (Anti-Lock Braking System), anti-theft systems. If you passed defensive driving courses – that might also have influence on your policy. Discounts for sustaining coverage may also have place. Periodically check the BMV SR22 requirement. We suggest you to check with BMV if you still need to have SR22 insurance. In case you no longer need it – your insurance provider will clear away your filing. Evaluate insurance policy with your provider. As a result, as time passing it may be possible to re-evaluate your insurance premiums. Due to the fact that convictions go away with the time it is always good to check if you are not overpaying for the policy. Consider buying a motorcycle along with motorbike insurance. This choice may not be the best for your lifestyle. On the other hand it can save you up to 50% on insurance payments. If your current insurance provider does not offer motorbike insurance – shop around. SR22 in Ohio is also applicable to motorbike drivers. However the costs can be much lower. That means more cash in your pocket! Now you can have a big party! So once SR22 requirement is over – you can always get back to a car driving. Keep liability coverage on your policy. Most of the accidents are happen due to collisions. That is why insurance companies take as much as they can for such type of accidents. Therefore if you want to save some cash – exclude full coverage from you policy and remove collision coverage as well. In other words just lower all your packages to minimums to prevent extra pay. Please keep in mind, that there is also should be a common sense between savings and being protected. So choose your options wisely. Select Insurance Group provides affordable SR22 insurance in Ohio. We shop multiple sources to provide best and cheap price on SR22 in Cleveland, Columbus, Cincinnati and other areas. Our licensed agents can help you with all your filing needs.